Doppler Photo: Photos and stories by Omari Stephens: Sears Pointless 2012: What's the point? The annual Sears Pointless race happened about two weeks ago. The race itself was a weekend affair, with a monumental downpour on Saturday and springtime weather by the time I showed up on Sunday. This year I basically tromped around the paddock, chatting it up, watching people battle against their cheap cars, and lending a hand here and there. Likewise, this post will be a chronological sequence of unrelated vignettes about the wonders and dangers of racing $500 cars. 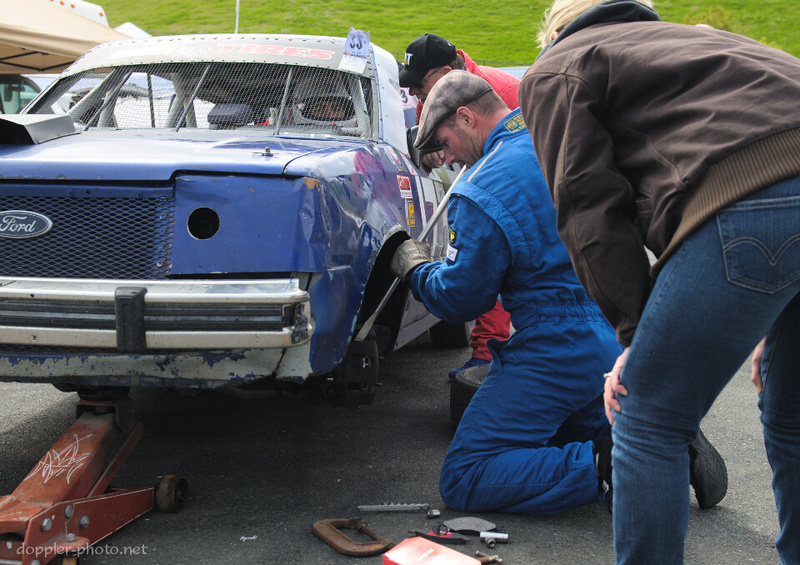 A case of the Sundays… There are times when racecars aren't awesome; instead, they're just frustrating. Maddening. Like a never-ending spiral of yak-shaving just so you can see if your car will actually start when it's all said and done. Fatigue is the mind-killer Endurance races often aren't about going fast so much as they're about not making mistakes. But fatigue is the mind-killer, and it can take its toll in the pits as well as out on the track. Only for it to be towed back in, six laps later. Why? Because somewhere in there, the oil plug didn't get tightened down properly. Just turn laps… Bad things happen when you run out of brake pad material. The #173 car pulled into the pits, and when one of the team members pulled a front wheel off, a cloud of brake dust emerged. The heat of running metal-on-metal had lightly welded the braking pad backing plates to the calipers. and had also damaged the calipers to the point where the brake pistons wouldn't retract at all, let alone far enough to fit the new brake pads. After 15 or 20 minutes with no progress, someone made the executive decision to slap the metal backing plates back in there and send the car back out on the track. "Just turn laps…" were the instructions for the driver. In the first few laps after the stop, the car lost 40 seconds per lap from its original pace, but by the closing laps of the race, they got down to the +10sec range. The other kind of ford… After walking around the paddock for awhile, I started exploring some tunnels (typically used to get to different parts of the racecourse). 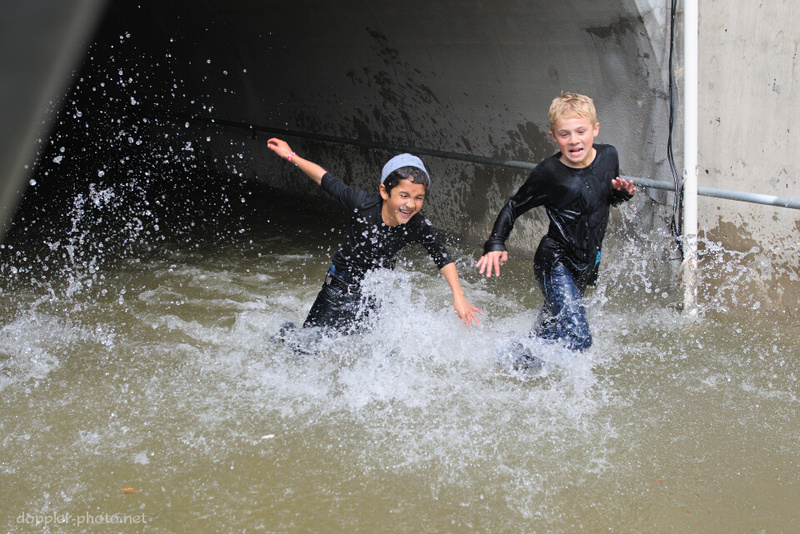 One of the tunnels had flooded after Saturday's deluge, and some boys found the tunnel before their chaperone found them. "By the time I got here, they were already soaking wet," she said. That's a LeMons moment… 24 Hours of LeMons founder John "Jay" Lamm (2nd from right) looks on as team Idiotarod pulls their spark plugs in preparation for another attempt to start their 2-stroke snowmobile-engined Miata. After a couple start attempts, the cylinders would flood with fuel, after which point the team would pull the three spark plugs, turn the engine a couple times to pump the excess fuel out, and then try again. When the engine finally coughed to life, after the spark plugs had been pulled twice already, Lamm had a chuckle at the LeMony nature of the car's startup procedure. 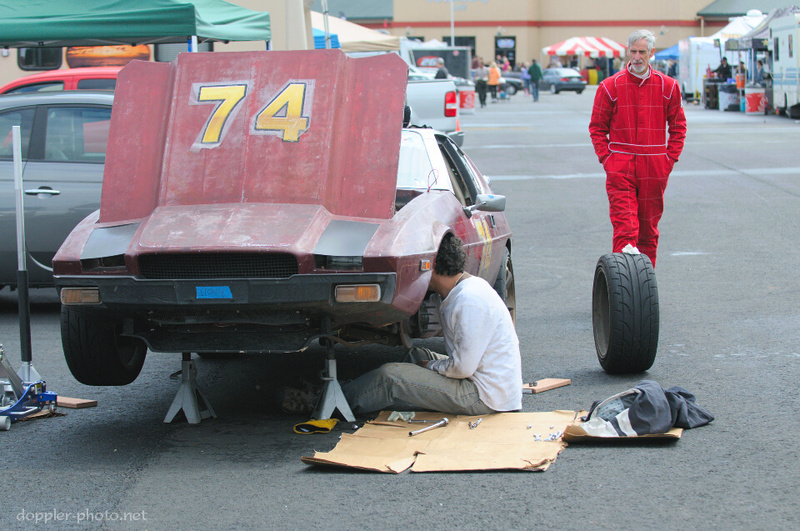 Party time… One of the great successes in the 24 Hours of LeMons race is simply taking the checkered flag. The race is in part a war of attrition — a number of teams don't make it that far (or, in the case of our car Saab Story, perhaps they don't even make it past the green flag…) So any time your car pulls in after the checker is occasion to celebrate. 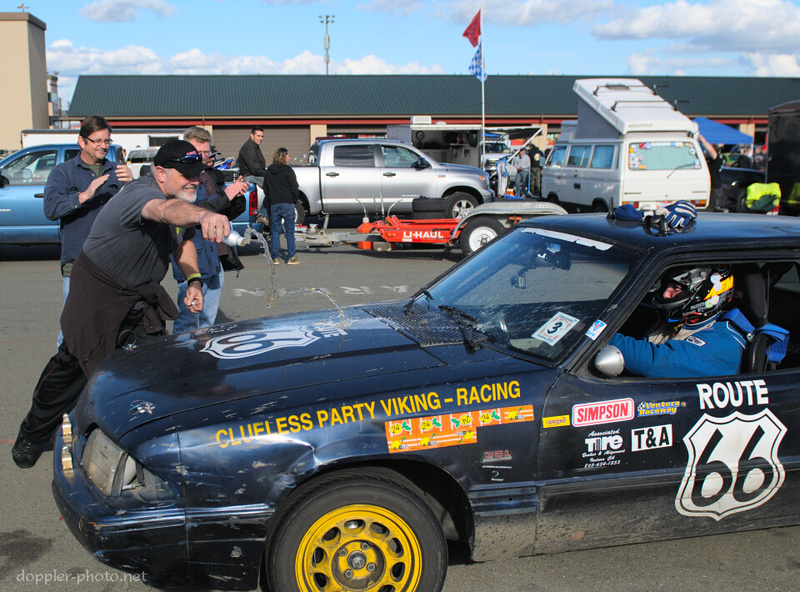 In this case, the Clueless Party Viking team got the party started after a 12th-place overall finish (out of 171 cars that started the race). True to form, the first celebration was emptying a 1-pint can of Coors Light onto the hood of the car, after which the driver got one to drink. 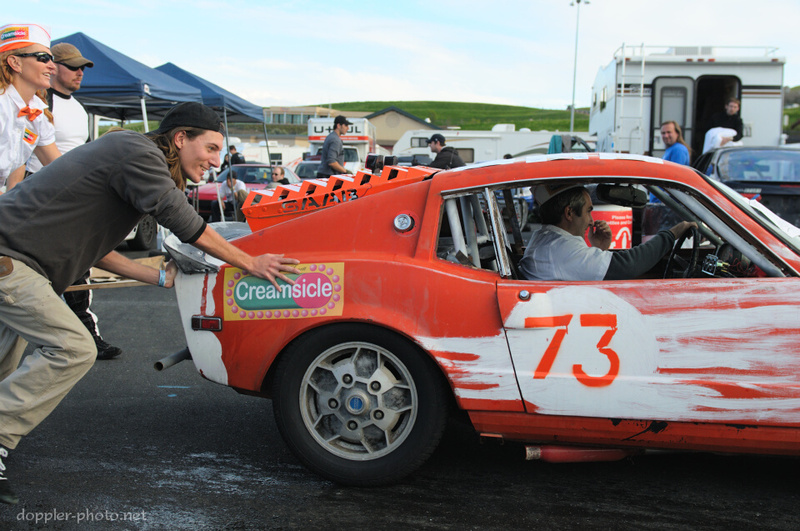 A happier Saab story… People race all kinds of old cars at LeMons, and there's pretty much something for everyone. Here, friend, teammate, and resident Saab guy Jerrit cracks a smile while helping to push a 1973 Saab Sonnett (the first ever in LeMons history, according to the organizers) back to its pit. This chapter of the Sonnett story ended up being a short one, though, as the car reached the four-tow limit by the time it had completed 23 laps.